The plains pocket mouse is the only member of the family Heteromyidae that occurs naturally in Minnesota, and it reaches the northern and eastern limits of its range here. At one time it was considered fairly common in the dune-sand region of Sherburne County (Bailey 1929). However, recent survey efforts to document the species have met with little success. During 1988-1995, sites of historical occurrence were trapped but few individuals were found. A new population of the plains pocket mouse was discovered at the Twin Cities Army Ammunition Plant in Ramsey County in 1995 (Birney and Monjeau 1997). Additional trapping efforts at this location in 1999 resulted in the capture of 36 individuals, slightly fewer than in previous years (Birney 1999). It is uncertain whether this population can sustain itself, even if disturbance and successional changes associated with vegetation are controlled. 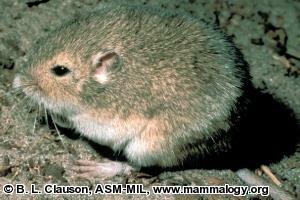 Due to the widespread and isolated nature of its populations, the plains pocket mouse was classified as a species of special concern in Minnesota in 1996. The most characteristic feature of the plains pocket mouse is the presence of visible, external, fur-lined cheek pouches, as no other mouse in Minnesota has them. Their fur color is variable based on the substrate that they live in, but generally is a cinnamon buff color with a mix of brown to black hairs on its upper sides and back (Hazard 1982). The fur on the belly is lighter with small white areas (Hazard 1982; Monk and Jones 1996). Plains pocket mice also have a deep grove on the front of both upper incisors. Adults have a total body length of 12.5-14 cm (4.9-5.5 in. ), with the tail making up half of that length (Monk and Jones 1996). Within Minnesota, the plains pocket mouse is restricted to open, well-drained areas, typically on sandy soils with sparse, grassy or brushy vegetation (Hibbard and Beer 1960). Plains pocket mice have home ranges of 0.02-0.05 ha (0.05-0.12 ac. ), in which they construct underground burrows. The burrows contain separate chambers for nesting and food storage. A small mound of sand surrounds the burrow entrances, which are plugged whenever the mouse is underground. Plains pocket mice hibernate through much of the winter, but because they do not accumulate much fat, they are suspected to awaken periodically to feed on stored food (Hibbard and Beer 1960). Activity resumes in spring, as soon as the ground thaws enough to dig (Bailey 1929). Females usually bear at least 2 litters annually, with an average of 4-5 young per litter. Plains pocket mice are mainly granivorous, feeding on seeds and fruits. They have been observed climbing up sedge stalks to reach fruiting bodies (Lemen and Freeman 1985). The external cheek pouches, from which their name is derived, are used for collecting seeds to store in caches for later consumption. Populations of plains pocket mice are often widely isolated and separated by areas of unsuitable habitat. This makes genetic flow between populations unlikely, and therefore individual populations must be protected because of their genetic diversity. Long-term monitoring of both vegetation and small mammal composition should be conducted, as changes in these characteristics indicate a decline in suitable habitat for the species. Habitat protection from human disturbance is also essential. Impacts of human development, including the introduction of cats and dogs and soil compaction from foot and vehicular traffic, can eliminate populations of plains pocket mice. Finally, it is important to protect habitat from successional trends, as an increase in the number and size of trees and thick ground vegetation will eventually attract meadow voles (Microtus pennsylvanicus) and drive out plains pocket mice (Birney 1999). When prescribed burning or discing are used as management tools on sites where the species has been documented, the area to be managed should be subdivided to avoid disturbing all potential habitat in any one year. The Minnesota Biological Survey (MBS) and the Nongame Wildlife Program have conducted or funded several surveys for the plains pocket mouse (Birney 1983, 1999; Stockrahm 1991). The MBS targeted this species during all of their surveys in suitable habitat, and they were successful at finding new locations for the species in 1990, 1996, 1997, 1999, 2000, 2004, and 2009, although limited numbers of individuals were found at each location, and one location was slated for destruction. A 1999 survey of the Twin Cities Army Ammunition Plant, site of the largest known plains pocket mouse population in the state, found slightly fewer plains pocket mice and significantly more voles than in previous years. The changing composition of small mammal species using this area is probably a result of the natural succession of the vegetation (Birney 1999). This area should be monitored and protected from development. Recent survey results indicate that human intervention is now necessary to prevent natural succession in the area, and to maintain its openness and attractiveness to the plains pocket mouse (Birney and Monjeau 1997). Bailey, B. 1929. Mammals of Sherburne County, Minnesota. Journal of Mammalogy 10(2):153-164. Birney, E. C. 1999. Status of the Plains Pocket Mouse (Perognathus flavescens) at the Twin Cities Army Ammunition Plant, 1999. Final report submitted to the Nongame Wildlife Program, Minnesota Department of Natural Resources. 10 pp + illustrations. Birney, E. C., and J. A. Monjeau. 1997. Plains Pocket Mouse (Perognathus flavescens) at the Twin Cities Army Ammunition Plant. Report submitted to the Minnesota Department of Natural Resources. 8 pp. + illustrations. Hibbard, E. A., and J. R. Beer. 1960. The Plains Pocket Mouse in Minnesota. The Flicker 32:89-94. Lemen, C. A., and P. W. Freeman. 1985. Tracking mammals with fluorescent pigments: a new technique. Journal of Mammalogy 66:134-136. Monk, R. R., and J. K. Jones, Jr. 1996. Perognathus flavescens. Mammalian Species 525:1-4.